Last weekend my maternal grandmother celebrated her 95th birthday. Everyone at the party remarked how fit and alert she looked. To me, she hasn’t changed much since my earliest memories, going back 40 years now. Grandma Kohlhagen, as my brother and I called her (Nama to her younger grandchildren and great-grandchildren) was a world traveler and one of the reasons I chose to study in Hong Kong. After hearing about my grandparents’ travels to Hong Kong throughout my childhood, it’s no wonder I gravitated toward this magical place. 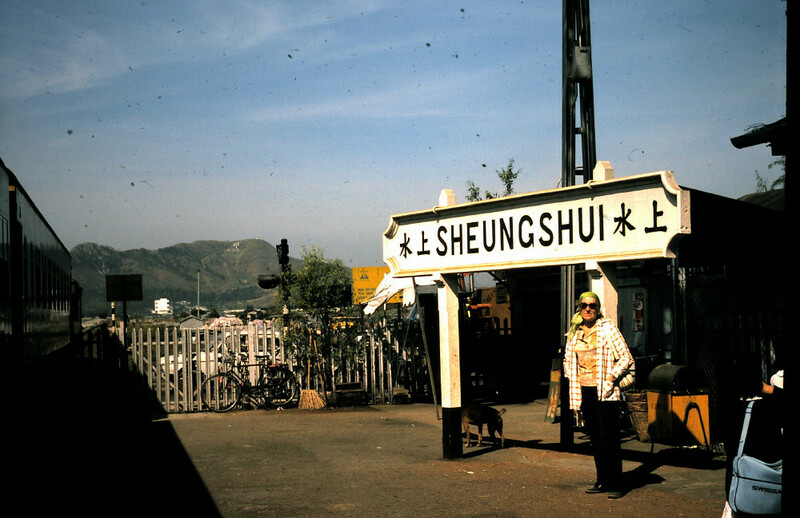 Here in this slide, taken in 1974 (my grandparents’ 3rd trip to the colony; they would return 4-5 more times) Grandma K is standing in Sheung Shui, one stop from Lo Wu, the town that borders China. Back in ’74 Sheung Shui appears as a sleepy outpost, romantic and remote. And I’m sure it was. But less than 20 years later, Sheung Shui wasn’t so sleepy and it certainly wasn’t romantic. I spent time in Sheung Shui attending traditional Chinese music performances with my former husband, dining at modest Chinese banquet halls, and trudging along the manicured streets of the modern new town, not unlike a handful of others that popped up in the New Territories between the time my family traveled to Hong Kong and when I arrived there in 1990. It’s great to see these pictures. Please post more! Thank you so much, Pete!! I’ll definitely post more.